Tara's name means "One Who Saves". She epitomizes the influence of the older mother-goddess cults upon the Buddhist Mahayana religion. Her concept evolved in India and later she became the most important goddess in the Mahayana pantheon. She holds a very prominent position in Tibet and Nepal. 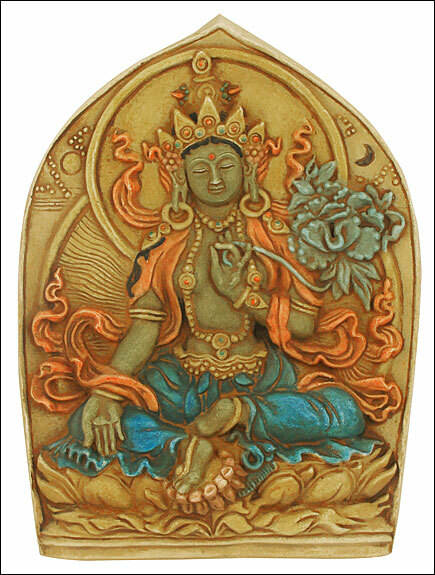 Tara was born from a tear of the Boddhisatwa of Compassion, Avolokiteswora. She was conceived primarily as a savioress and is, therefore, the female counterpart of Avolokiteswora. She is also generally regarded as his consort and is frequencly protrayed with him. Tara is believed to protect the human beings while they are crossing the ocean of existence. Her compassion for living beings, her desire to save them from suffering, is said to be stronger than a mother's love for her children. Her most distinctive emblem is the blue lotus which she carries in her left hand. Among the forms of Tara: when she is red, yellow and blue, she is in menacing mood; white or green she is gentle and loving. This is the same twofold nature as Shiva's wife.